The Town of Ledgeview may have only 17.5 square miles of township, but it is a popular place. Ledgeview is full of schools, parks, stores, and beautiful homes. It’s just far enough away from the big City of Green Bay and De Pere, but still close enough to use their amenities. Did you know that the Town of Ledgeview used to be called the Town of De Pere? Well, it did. Ledgeview ended up changing their name so as to not be confused with the city of De Pere. Ledgeview actually asked De Pere to change names first, since the Town of De Pere (Ledgeview) was there first. The city of De Pere respectfully declined, and so the Town of Ledgeview became the new name. Ledgeview has beautiful parks. You can play ball on the fields, or use the paved trail for biking, walking, jogging, skateboarding… Check out the Fox River Trail and the East River Trail. Or click here for more info on Ledgeview’s park system. Ledgeview has some great restaurants that are perfect for date night, or a casual night with friends and family. Check out the best eating and drinking restaurants here. There are all types of custom built homes in Ledgeview. It does seem that most of the homes are on the newer side and are on larger lots. If you’re looking for some acres, it would be wise to take a look and see what Ledgeview has to offer. The past year 89 homes were sold and new people moved in. The average number of days on the market was 84. The average percent of homes listed that sold was 99%. The Town of Ledgeview is located just south of Brown County. It borders De Pere to the west, the village of Bellevue to the north, the town of Eaton to the east, the town of Glenmore to the south, and the town of Rockland to the southwest. 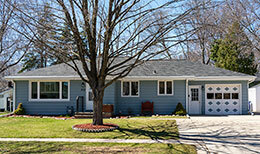 What Homes are Available in Ledgeview, WI? New houses come on the market in Ledgeview regularly so if can’t find that perfect house today, let Elysia know what you’re looking for and she can monitor the market and alert you when something meeting your criteria is listed. Click Here for a current list of homes for sale in Ledgeview.